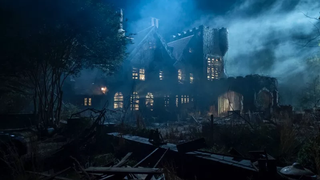 The sixth episode of Haunting of Hill House is a remarkable cinematic feat, designed to look like one long shot that weaves and winds its way through the episode. Now, Mike Flanagan, the show’s writer and director, has broken down how it came together. In a long, fascinating Twitter thread, Flanagan talks about the episode from conception to production. According to him, an episode shot like this was a part of the series from the pitch itself, and the script includes much of the camera flourishes in it. But the most fun part of this thread is describing the logistics necessary to make it all happen—which required a lot of actors running from place to place, and more than a little luck. The subsequent thread is, uh, very long, so I’m not going to quote the whole thing here. But it’s worth checking out if you’re interested in cinematography or good horror. Haunting of Hill House is available to stream on Netflix now. Here’s what we thought of it.